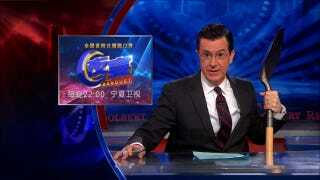 A Chinese show called The Banquet is being accused of ripping off The Colbert Report's opening. For good reason! As The Atlantic pointed out late last week, the show is called The Banquet and broadcasts on Ningxia Satellite TV, so it's more of a local production. However, The Colbert Report does have a sizeable following in China, making the program's decision to borrow so liberally all the more puzzling—and, from the sound of it, frustrating for Chinese Colbert fans. "[The Colbert Report] can go ahead and sue us!" a broadcaster spokesperson told The Atlantic. "We haven't received any complaints from their lawyers." The show, however, seems to have hastily changed their opening, with some handheld-filmed footage. "Folks, this is nothing more than wholesale theft... and I love it," Colbert said recently (noted by Nanfang Insider earlier today). One thing The Banquet did not copy was The Colbert Report's smart, funny look at politics. Instead, as The Atlantic points out, it's filled with tired, corny jokes about, for example, family life. This isn't the first time Chinese television has borrowed opening sequences from other shows. But, will it be the last?